Home SEND SEND Resources The benefits of ‘Floortime’ for autism – and win tickets to a Floortime workshop! An US company that offers a unique therapy to help parents and professionals communicate better with children with autism/special needs, is offering London-based workshops in the the technique. Floortime is a specific therapeutic technique based on the Developmental Individual Difference Relationship Model (DIR) developed in the 1980s by Dr. Stanley Greenspan. The premise of Floortime is that an adult can help a child expand his circles of communication by meeting him at his developmental level and building on his strengths. Therapy is often incorporated into play activities - on the floor. I had never heard of Floortime therapy before, but some basic research revealed a lot of positive feedback as a well-established technique including some interesting evidence-based research. Jake Greenspan, the son of Dr Greenspan, has generously offered Special Needs Jungle one ticket to give away to a parent and a discounted ticket for a professional. Here, he explains more about Floortime: "The goal of Floortime is to help the child reach developmental milestones that contribute to emotional and intellectual growth such as interest in the world, relating to others, complex communication and emotional thinking. If your child has difficulties relating, communicating, or socialising, or if strong emotions like anxiety, frustration, or anger trigger tantrums and meltdowns, Floortime can help. Instead of trying to address every symptom and teach a child each missing skill, Floortime focuses on strengthening the core of the problem. For example, when a child develops better communication and expressive language, behaviour improves. When they learn to think and problem solve, they experience less frustration. To help children do this they have to enjoy communicating and want to push themselves. Floortime focuses on developing a close positive relationship and challenging children within fun activities of their choice so they want to succeed. By identifying and improving the cause of the symptoms children want to be more related, communicative, and logical. Their behaviour improves because they are happier and better thinkers. The relationships they build become the foundation for all future friendships. For children to be successful in school and life, they need to learn to think on their own. Parents - Learn to help your child think and learn at home during everyday activities and fun play-based sessions. Improve their attention, communication, and behavior. 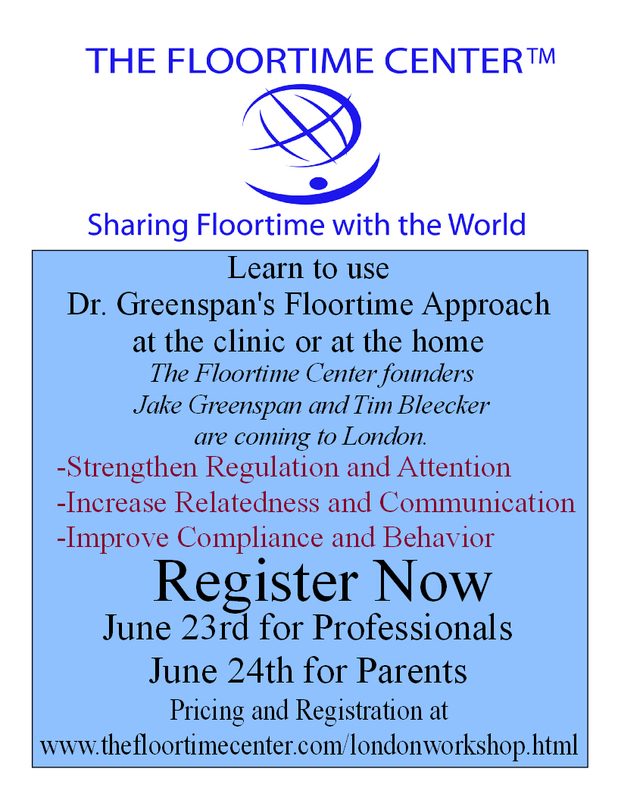 Professionals- Learn to do Floortime and integrate its principals into your own curriculum in a Speech, OT, or Special Education setting. Join us on the 23rd or the 24th June at Morris Lecture Theatre, St. Bartholomew Hospital London. Please visit our website at this link for information on research, pricing, and registration. Hi Tania– Your post is fabulous! Your readers can find more information on Floortime’s new official blog at http://thefloortimecenterblog.com. We’d love if you’ll be willing to pass on our blog info!